The ECLIPSE FN1-developed especially for electrophysiological research-features enhanced operability in every aspect to facilitate patch-clamp experiments. Advantages offered by the FN1 include slim body, streamlined structure, improved electrode placement, long working distance, and greater noise reduction. 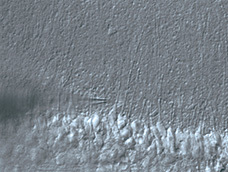 A deeper area of the specimen can be observed clearly with IR light. The newly developed high NA, long working distance 16x objective (NA 0.8, W.D. 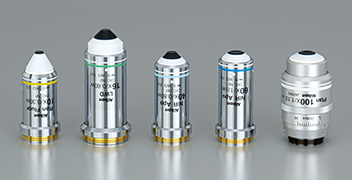 3.0) provides 5.6x, 16x, 32x and 64x magnifications when combined with an optional magnification module. This objective enables observation from a low magnification widefield of up to 2.0mm to a high magnification high resolution field without changing objectives. 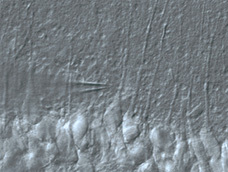 Axial chromatic aberration in near-infrared region (up to 850nm) has been corrected in 40x and 60x objectives to clearly observe the minute structure of a thick specimen. The 100x objective (NA 1.1, W.D. 2.5) is the world's first water dipping lens with depth-induced aberration correction. Because of its special correction ring, this lens can correct spherical aberration induced by imaging deep in tissue or by working at physiological temperatures. 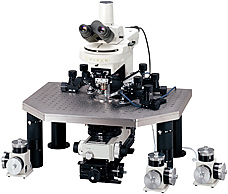 Consequently, it is ideal for IR-DIC imaging and confocal applications as well as Multi-Photon imaging. 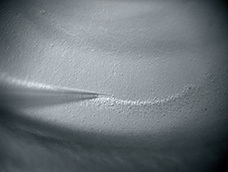 Alternating the wavelength from visible to infrared or the illumination technique from DIC to Oblique Light is carried out simply by rotating the condenser turrets. Access of microelectrodes to the specimen is easy as the objectives have a long W.D. 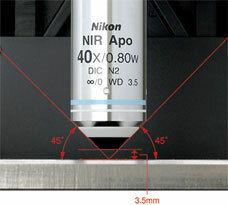 of 2.5-3.5mm and broad approach angle up to 45°. Objectives mounted on the sliding nosepiece can be raised when switching magnifications. This prevents the objective from colliding with the manipulator or the chamber. The retraction distance is 15mm, so even a thick glass dish is protected. 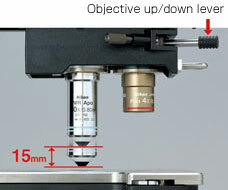 The lens top can be easily dipped (approximately 1mm) into the bath solution by using the lever to eliminate the risk of specimen disturbance. 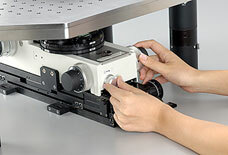 The focus knob and field diaphragm ring are located on the front part of the microscope base, and there are no cumbersome outside belts; so operation is easy when using a fixed stage. An optional remote handle is also available to enable operation from outside the cage. 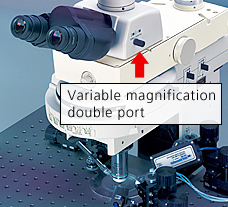 Electrical noise has been successfully reduced by utilizing fiber illumination to bring light into the system from outside the cage and by connecting ground pins to all main parts of the microscope. Vibration noise has also been reduced by undertaking critical measurement and simulation analysis to improve microscope rigidity. 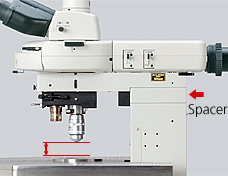 By inserting a spacer between the body and the arm, you can raise the microscope height 10-30mm. This facilitates large specimen observation. 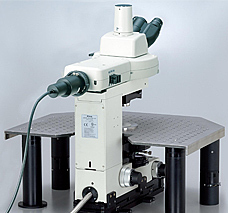 Moreover, the condenser, sub-stage and turret can be removed entirely from the microscope to allow for more free space, depending on the purpose of the experiments.